We manufacture virgin quality co-extruded quality ultra violet resistant Tarpaulin LDPE Films in widths up to 18 feet. Our tarpaulin is available in many different colors, inside and outside layers are of different colors, the film is having gusseted four fold, so a width of 18 feet will have a roll of only 4.5 feet width and hence is very easy to transport, store and also sell in shop. Since it is UV protected it does not get brittle when used for storage where Sun light falls, unlike many product made of woven PP that gets brittle when lying in sun. 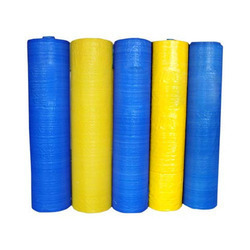 It finds wide application in covering goods lying in open ground , it protects against rain, dust , sun light . Can be used for agricultural, industrial applications like soybean, food grain storage, cement, sugar, automobile industries as well as poultry farms, and spice boards. We follow ethical business practices and highest quality standards, which has enabled us to create repute for our range in the domestic market. Low weight per square meter.